Bulk Category and Coaxial Cables | 3 Star Inc.
We offer the best combination of quality and prices that you can find on coaxial and category cables. Most of the cables we sell are made in the USA, some even with a LIFETIME Warranty. 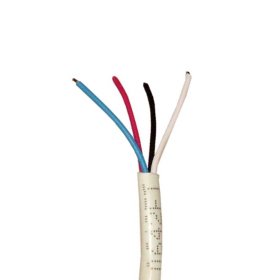 These are cables like RG59 for CCTV, RG6 for indoor, outdoor and underground runs. RG11 for your loger distant outdoor projects. Plus we also have 50 Ohm available in custom lengths and pre-terminated for your convenience. Each category above will take you to where you will find the best prices and fastest same day shipping straight to you. As always we are here to help, just a simple phone call away we can answer your questions and help you navigate your online purchase. RG59 is Flexible Coaxial Drop Cable used Primarily Today for CCTV (Closed Circuit TV) Applications. In the Early Days of Cable TV, 300 Ohm twin lead was used. 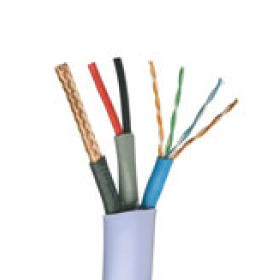 When the transmission lines used changed to 75 Ohm Coaxial Cable, RG59 was introduced as the premise distribution cable of choice, installed in many Homes and Apartments that is still in use today. For the Higher Frequencies and Bandwidths of Modern Cable TV design, RG59 is very lossy and should be replaced with a lower loss cable (like RG6) at any opportunity. 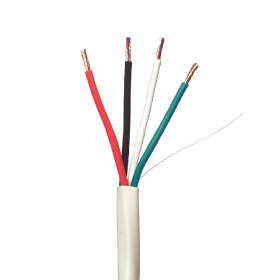 RG6: (RG-6 or RG-60) is the most commonly utilized 75 Ohm flexible braided shield coaxial drop cable in use by the CATV (Cable TV), TV Antenna and Satellite TV Broadband Industries today. When used in common distribution lengths of around 150 feet, it provides the best combination of Signal loss versus size and diameter; the later being of importance when navigating the small spaces afforded most chases and wall-plate boxes. 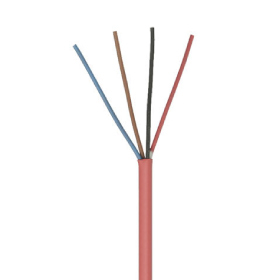 RG6 Cable featuring 60% Braided Shield is comprised of an Aluminum Foil bonded to the Foam Dielectric with Aluminum Braided Shield with 60% coverage. Quad Shield RG6 would denote alternating Aluminum Foil and Aluminum Braided Shield Layers, starting with the Bonded Foil Layer around the Foam Dielectric, with the best Quad Shield having 2 Layers of Braided Aluminum Shield, one of 60% and the 2nd at 40%. Tri-Shield RG6 will have 77% Braided Aluminum Shield Coverage Between 2 Layers of Aluminum Foil Shield, the 1st Foil Layer being Bonded to the Foam Dielectric. RG6 is lower in loss when compared to RG59. RG11 or RG-11 is to 75 Ohm as RG213 or RG214 is to 50 Ohm cable. 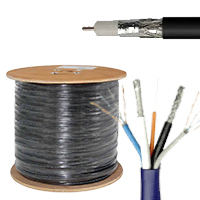 RG11 Cable featuring 60% Braided Shield is comprised of an Aluminum Foil bonded to the Foam Dielectric with Aluminum Braided Shield with 60% coverage. Quad Shield RG11 would denote alternating Aluminum Foil and Aluminum Braided Shield Layers, starting with the Bonded Foil Layer around the Foam Dielectric, with the best Quad Shield having 2 Layers of Braided Aluminum Shield, one of 60% and the 2nd at 40%. Tri-Shield RG11 will have 77% Braided Aluminum Shield Coverage Between 2 Layers of Aluminum Foil Shield, the 1st Foil Layer being Bonded to the Foam Dielectric. RG11 is the lowest loss Flexible Braided Shield Drop cable Commercially Manufactured for Satellite TV, TV Antenna and Cable TV usage. Use for distances over 150 feet or when every dB counts. Structured Cable Products and Home Network Wiring: is Bundled Together for Economy in Space and Ease of Installation, the Component Cables and Wires should still be treated as Individual with the Systems to which they belong as compared to the Whole. No One System should be Sacrificed to serve the Needs of Another. When Preparing Terminations, Leave Plenty of Tail before Prep, and Plenty of Spare to Coil after. This will Serve Future Expansion Well. Most Manufacturers know the limitations of the Individual Wires and Cables their are Bundling, Make Sure you do too. It is Especially Important to Approach Installation as the Most Fragile of Components as the Major Consideration. Bulk Wire CAT3 or Telephone Cable, also known as UTP cable, stands for Unshielded Twisted Pair cable and is designed to reliably carry data up to 10 Mbit/s, with a possible bandwidth of 16 MHz. It is part of a family of copper cabling standards commonly used everyday that also includes CAT5, CAT5e and CAT6. Category 3 was a popular cabling format that was used for Voice and Data for years. Cat 3 is currently still in use in two-line telephone systems as Millions of Homes and Offices are still wired with CAT3 for Voice and Technically, the trunk and distribution cable used by the Telephone company to get to your home or office from their Central Office is CAT3 as well. CAT5E, where the E is for 'Enhanced' Operates at up to 350 MHz, instead of the 100 MHz of standard CAT 5 cables. These CAT 5E cables are fully ANSI/TIA/EIA 568 B.2-1 compliant. CAT 5e cables are compatible with the current Category 5E Equipment, as well as Legacy and CAT 5. The Enhanced Electrical Performance of CAT 5E cables ensures capacity in supporting increased Bandwidth Application Requirements. Typical applications would include, Gigabit Ethernet, Distributed Video (CCTV) over CAT5E, Voice over IP (VoIP). 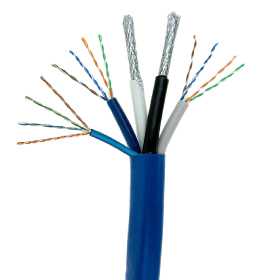 CAT6: Operates at up to 550 MHz, instead of the 350 MHz of standard CAT 5E cables. These CAT 6 cables are fully ANSI/TIA/EIA 568 B.2-1 compliant. CAT 6 cables are compatible with the current Category 6 Equipment, as well a Legacy and CAT 5. The Enhanced Electrical Performance of CAT 6 cables ensures capacity in supporting increased Bandwidth Application Requirements. Typical applications would include, Gigabit Ethernet, Distributed Video (CCTV) over CAT 5E, Voice over IP (VoIP). Security Cable and Wire made for Professional Alarm and Security System Installations. Note that Some cables may contain Wire that has twisted Copper Conductors as Opposed to those of Solid Bare Copper Conductors. Cable Jacketing will Also Vary between Types and Classifications from CM, CL, CL2, CL3 with Riser(R) and Plenum(P) Designations. While each Serves the Same Purpose in delivery of Low Voltage and Signal Distribution, Their Use per Classification is Covered by Several Different Standards and Codes. Make sure that the Cable and Wire You Purchase Equals or Exceeds the Classification of Use as to Avoid any problems during Inspection and Validation of Your System. Speaker Wire: performance is gauged by Resistance, Capacitance, and Inductance. The shorter a wire is, the better, as resistance increases with length. As long as the resistance is kept to less than 5% of the speaker impedance, it will suffice for home use. The resistance of speaker connection cable in 16-gauge or heavier wire has no detectable effect in runs of 50 feet or less in most loudspeaker connections. The lower the impedance of the speaker, the greater the impact of the resistance of the speaker wire will have. High power car audio systems using 2 ohm speaker circuits need relatively thick cables. Fire Alarm Cable and Wire:Conventional Fire Alarm Systems, in their various forms, have been around for many of years and have changed little in that time in terms of technology although design and reliability have improved significantly. However, Conventional systems are a well proven technology protecting many hundreds of thousands of properties worldwide. A Conventional Fire Alarm System is often the natural choice for smaller systems or where budget constraints exist. In a Conventional Fire Alarm System the "Intelligence" of the system resides solely within the Fire Alarm Control Panel. The panel receives a trigger signal from a Conventional Detector or Initiating Device Circuit (Smoke, heat, flame detectors) which in turn signals the condition to the Notification (Indicating) Device Circuit such as alarm sounders, horns, strobes and other remote signalling equipment. Conventional detectors are normally connected to the Fire Control Panel via dedicated circuits, each circuit protecting a designated "Zone"or area of the building. The system has different modes: Normal, Alarm, Trouble, and others, depending on the Fire Alarm Manufacturer. Thermostat cables: while not the most complicated cables ever constructed, are used in every household, commercial, and industrial application. They are the communication link between a heating or cooling apparatus and its control mechanism. Thermostat Wire is a class 2 power-limited circuit cable for use in thermostat control applications. Thermostat wire goes from your heat system to your thermostat. Thermostat wire and cable is used for signal systems, intercom, burglar systems, remote control and heating and air conditioning in 18 and 20 awg sizes. It is made with a similar number of strands that thermostats have and perfect amount of thickness.